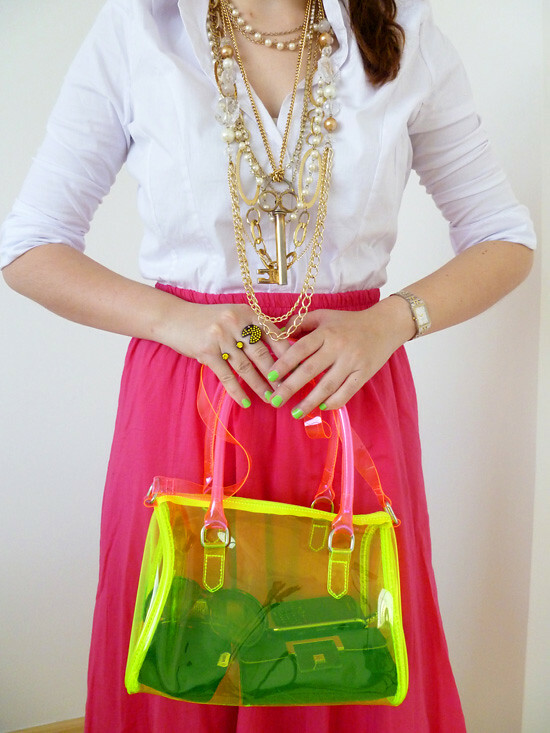 The Joy of Fashion: Neon! Key necklace: Used to be my mom's in the 60's! 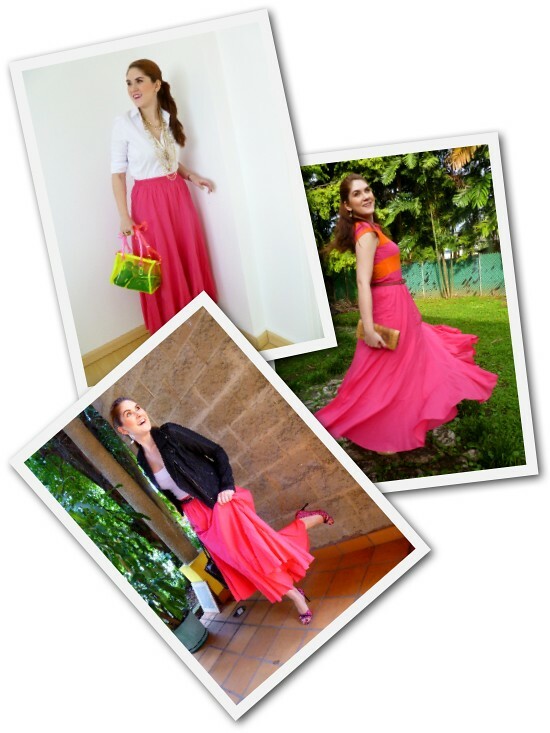 Pair a classic white button down shirt with a bright pink maxi skirt (This one from Old Navy is only $20.99!) and a neon green bag! Finish the look off with beige pumps and multiple necklaces. Work + Got together with my boyfriend and some of his friends. Today's outfit is all about the bright neon colors! I felt sooooo bright and bold. This neon bag is one of the many purchases I received in the mail the other day. I know it's transparent and that you can see everything I'm carrying, but I still LOVE this purse! Would you ever wear a clear purse like this one? I like that neat clear, neon bag of yours! And the way it matches your nails is simply perfect. :D You're brave to carry things around in that bag, I feel like it'd be dangerous or something to carry that around hahaa. This outfit is so fun! Love how you styled neons! That pacman ring is really fun. The pink dress is fabulous! So many cool ways to wear it! I LOVE your skirt, and i need to say (AGAIN) that i LOVE those shoes. Buenas preciosa! Muchas gracias por pasarte! Te ves genial, como siempre (: Me ha encantado la falda! I love everything about this outfit! It's definitely something that I look forward to wearing, too :). The pink and white are just so happy together. The skirt is absolutely stunning! 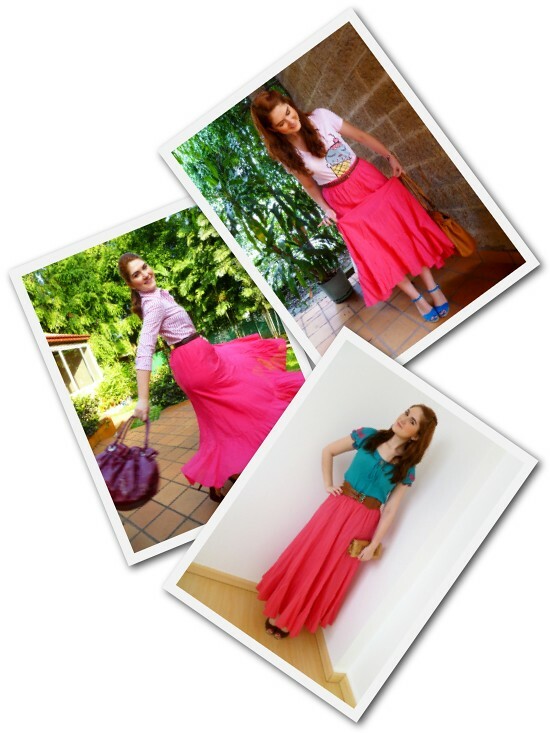 I love the colour and the picture of you twirling with it on!